Trần Minh Châu, 14, is one of the youngest people among 10 others receiving Việt Nam’s Outstanding Youth Awards for the Year 2017. She has successfully passed an exam to study culture and art for talent between now and 2025, approved by the Prime Minister. Her achievements last year included first prize at the Ricard Vines International Piano Contest in Lleida, Spain, first prize at the AFAF Piano International Concerto Competition in the US, first prize at the Future Stars Piano Competition in Poland, and more. Young talent: Trần Minh Châu with her piano at home. Born in Hà Nội, her parents were not artists, but from the age of four Châu displayed musical talent. She often sat side by side with her elder sister to watch her play the piano. “She seemed to be hypnotized when her sister was playing a melody. 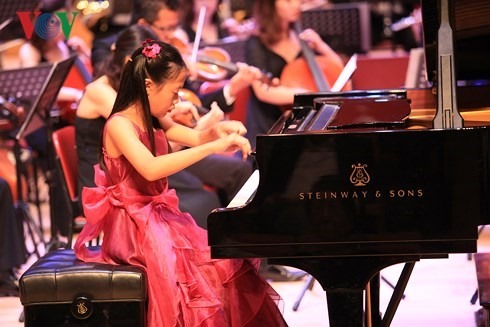 Despite her young age, we decided to allow her to learn the piano,” said Châu’s father Trần Đức Minh. 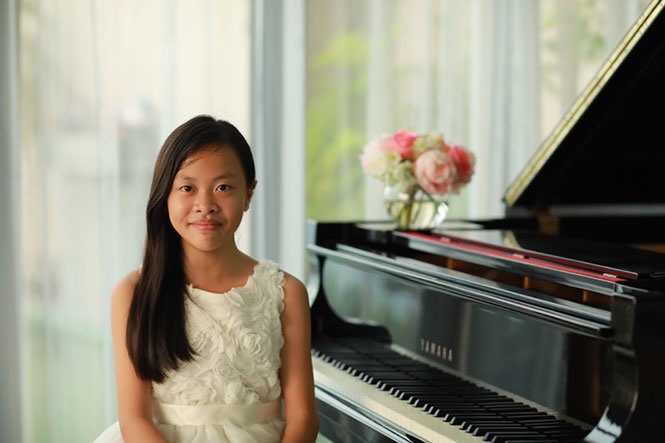 Châu’s piano teacher, Nguyễn Thu Hương, told her parents that their daughter had a natural gift for the piano, and asked the family to create favourable conditions for her to develop her talent. At the age of 10, Châu enrolled in the Việt Nam National Academy of Music to study piano, taught by Professor and People’s Artist Trần Thu Hà. At the age of 11 she joined the 18th International Music Competition “Pietro Argento” in Italy for the first time. Châu won the first prize for competitors aged between 10 and 13. The competition had 100 competitors from 20 countries. Since then she has won many prizes at international piano contests. Châu said she was challenged at the contest last year in Spain because she had to compete against many talented musicians from countries with long standing traditions of classic music such as Germany, Russia, Hungary, Portugal, Switzerland and South Korea. “I was dazzled by these competitors, who were taught by world famous teachers, but I just thought that I had to calm down and be confident to compete with them,” she said. Despite difficult contest panels, Châu won first prize for competitors aged 12-14. Upon returning from Spain, she continued to immerse herself in study at the Marie Curie school, and at the national music academy. “My dream is to become a pianist and perform in many countries. I would like to bring classical piano music to audiences around the world, particularly young ones,” said Châu, noting that her favourite piece of music is the Hungarian Rhapsody No 11 of Franz Liszt. Every day Châu spends around 3-4 hours playing the piano. To prepare for international contests, she has to invest between 6-8 hours per day, said her father Minh. “Hard work and international experiences have inspired my daughter to improve her playing of the piano,” said Minh. 2015: Gold medal at Asia International Piano Academy & Festival in South Korea; third prize at International Rosario Marciano in Vienna, Austria. 2016: First prize at the Lansum International Music Festival, California, the US. 2017: First prize at the International Piano Contest ’Maria Herero’ in Spain.